A fungal nail infection is also known as Onychomycosis. It’s caused by a dermatophyte fungi; the same fungus that causes athlete’s foot. This fungi can also infect the hard material (keratin) that makes up the nail. It develops slowly within the nail, causing it to become discoloured, thickened and distorted. These infections vary and can affect all or just part of the nail. The most common sign of a fungal nail infection is the thickening and discolouration of the nail itself, usually turning it yellow, white, black or green. The good news is that these infection rarely cause any pain or discomfort. The nail itself may seem unattractive but in most cases a fungal nail infection will not cause any further complications. Fungal nail infections are far more common in toenails. The most common causes of a fungal nail infection is a pre-existing fungal skin condition (e.g. Athlete’s foot) or damage to the nail or the surrounding skin. The fungi that cause the infection thrive in damp, warm conditions, so an infection is far more likely to occur after wearing trainers and sports shoes for prolonged periods. If you are susceptible to hot, sweaty feet then there is an increased chance of developing an infection. As stated above the easiest way to identify a fungal nail infection is when the nail becomes discoloured or thickened. It is rare for an nail infection to cause pain but in some cases, if left untreated, this can be the case. If a toenail is affected then it may be uncomfortable walking and wearing shoes may become painful. If the infection is in the fingernail then writing and using other such utensils may become problematic although these occurrences are rare. If the infection is allowed to progress then other symptoms may develop. The nail can become crumbly and brittle, with pieces breaking off from the toe or finger completely. The skin around the nail area can also become painful and inflamed. Other symptoms that can develop to the surrounding skin include; white or yellow patches on the nail-bed and scaly skin around the nail. The first time you experience a fungal nail infection, you should always seek diagnosis from a healthcare professional who can confirm the diagnosis. Usually a doctor, nurse or pharmacist will visually examine the nail. For particularly serious infections, a doctor may choose to take a clipping that will be sent to a laboratory for analysis. This will allow the doctor to decide whether your nail has a fungal infection or if it has been damaged instead. If the results indicate that the nail is simply damaged then antifungal treatments won’t be required. Subsequent courses of treatment or fungal nail infections are suitable for self-diagnosis as long as the symptoms have remained the same and are not severe. For help diagnosing your fungal nail infection, please get in touch and one of our healthcare professional will be happy to assist you. What treatment is available for Fungal Nail Infections? The two main forms of treatment for Fungal Nail Infections are nail paints and tablets. 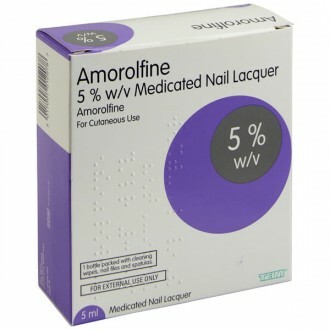 The first line of treatment will be the antifungal nail paint containing Amorolfine 5%. The advantages of these types of treatment are the application need only be applied once a week and there is no risk of experiencing the side effects associated with the oral antifungal tablets. Generic Amorolfine lacquer and Curanail are both available from our Online Pharmacy for topical treatment of finger- and toe-nail infections. These treatments usually work by stopping the growth of the fungus, the infection will then clear as your nail grows out. Depending on the severity of the infection, a fingernail can take up to six months to completely clear with a toenail potentially requiring up to twelve months of treatment to completely clear. If your nails have become thick, it can help to file them down before treatment. This will allow the medicine better access to the infection. 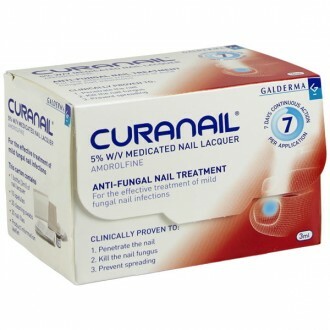 Antifungal tablets treat fungal nail infections and are prescribed by a GP or nurse. The most commonly prescribed antifungal tablets are Terbinafine. These treatments are usually very effective, plus the have the added benefit of clearing up any other associated fungal infection at the same time, for example athlete’s foot. Depending on the severity of the nail infection, they may need to be taken for anything from six weeks to six months. As with all medication there will always be a small risk that there may be side effects. The most common associated with antifungal tablets are; headache, nausea, diarrhoea, itching and a loss of the sense of taste. During treatment you should also follow the tips detailed below in the 'Prevention' section to speed up healing and prevent recurrence of your fungal nail infection. Try to avoid injury to the nail, as damage nails are more prone to developing an infection. Wash your hands and feet regularly with soap and water. Ensure to dry thoroughly, especially in between the fingers and toes. Keep your nails trimmed short and file down any thickened areas. If using a communal bathing or shower facility, wear footwear such as flip-flops to protect against picking up an infection. Try to avoid towel sharing as this can pass on the infection from one person to another. Replacing old footwear, which potentially could be contaminated with fungal spores. Wearing socks that absorb sweat; fabrics such as wool, nylon and polypropylene are effective at wicking away moisture. Using an antifungal spray or powder in your shoes and socks will help prevent an infection from developing. Try to avoid using nail polish and artificial nails as this can trap unwanted moisture, which will worsen the infection. Always wash your hands after touching an infected nail as the fungus can spread from nail to nail. Avoid trimming and picking at the skin around your nails as this can provide germs access to your skin and nails. Can people with diabetes treat a Fungal Nail Infection? If you suffer with diabetes it is recommended that you consult your GP before treating a fungal nail infection. This is to ensure that there are no complications with your infection and that your symptoms are not caused by uncontrolled blood sugar. This will confirm that any treatment prescribed or purchased will be safe and effective for you. Can I still apply nail polish to an Infected Nail? It is advised that you do not apply nail polish to an infected nail. It will likely make any treatment you are using less effective and increase the likeliness of you spreading the infection to other nails as well. Am I more likely to get a Fungal Nail Infection if I have athlete’s foot? Yes, it is thought that up to 90% of the fungus that causes the infection in athlete’s foot also cause fungal nail infections. Athlete’s foot is generally much easier to treat than a fungal nail infection so ensure you treat any case of athlete’s foot quickly to stop it spreading to a nail. When should I go to the doctor if I suspect I have a Fungal Nail Infection? You should see your GP if you have a fungal nail infection that affects more than two nails, or if you are diabetic or pregnant. Children should also see their GP if a fungal nail infection is suspected. Can I treat a fingernail or are the available treatments just for toenails? No, most available treatments are suitable for use on fingernails and toenails. As fingernails are smaller they usually clear up quicker than toenails with treatment. Will my Fungal Nail Infection get better on it’s own if I chose not to treat it? It is unlikely your nail will get better if it is left without treatment. The infection will likely get worse with the nail becoming thicker and more brittle. The earlier you start treatment, the quicker and easier it will be to get your nail back to full health.